Joe Sandulli has been practicing labor law in Boston since he arrived here in 1970. On April 1, 1977 Joe opened his own law practice which has since grown into the present firm of Sandulli Grace, P.C consisting of twelve attorneys. Joe believes that he has traveled every back road in the Commonwealth visiting clients over these 39 years. He has counseled and educated clients on how to solve problems and avoid litigation. He has negotiated countless collective bargaining agreements. And when clients have not been able to solve problems he has tried their cases before arbitrators, agencies, and in state and federal courts. 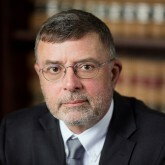 At this point in his career, Joe has also become a resource for the firm, providing a repository of labor history, developing creative solutions to legal problems and rating arbitrators and judges. Joe grew up in Bristol, Connecticut and graduated from Bristol High School in 1961. He received a Bachelors in Chemical Engineering from Carnegie Institute of Technology (now Carnegie Mellon University) in 1965. Joe went on to law school at the University of Pennsylvania where he discovered his interest in labor law and graduated in 1969. He is the recipient of the 2008 Cushing Gavin Award from the Boston Labor Guild for excellence in labor-management relations exemplifying moral integrity, professional competence, and community concern.